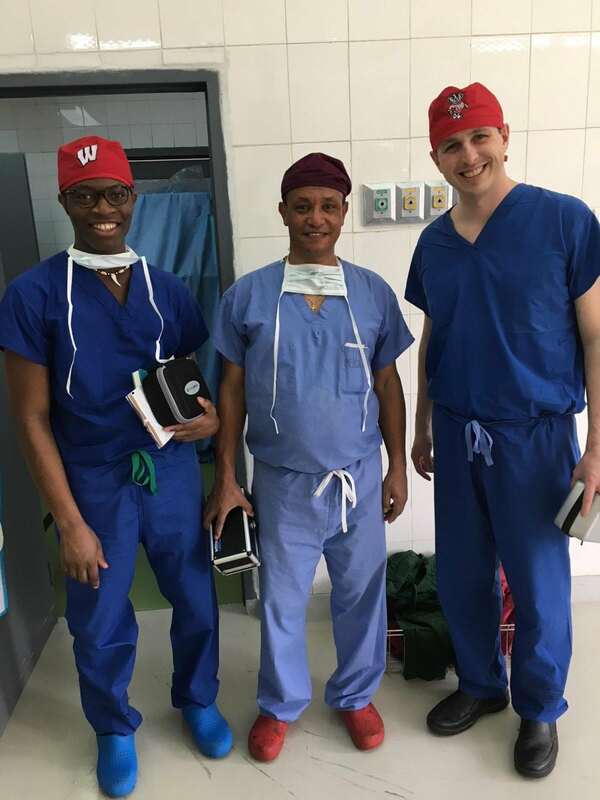 UW general surgery resident Dr. Callistus Ditah, local surgeon Dr. Nebyou, and UW vascular surgeon Dr. Paul DiMusto after a case in the OR. Increasingly, a modern surgeon is a global surgeon. Whether through clinical service or research collaborations, today’s surgeons do global work. 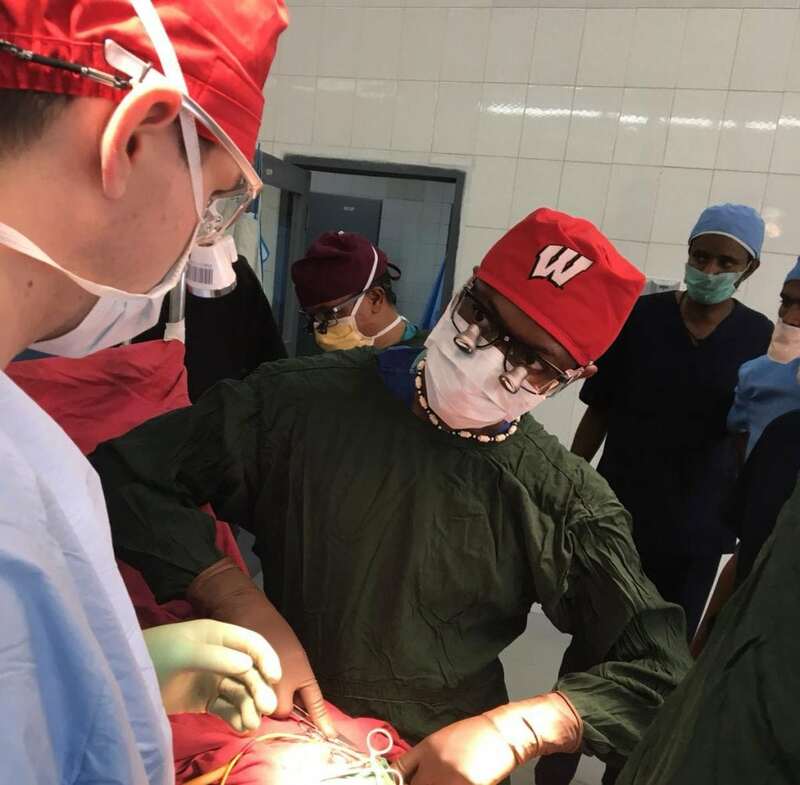 That’s why the Department of Surgery is excited to announce a new global health opportunity in our Department: an accredited four-to-six week elective international rotation, offered by the University of Wisconsin Hospitals and Clinics and our Department for 3rd and 4th year surgical residents. For our residents, the rotation will introduce them to practice in resource-limited environments, to disease states and advanced pathophysiology not encountered in the United States, and to culturally diverse, under-served populations. 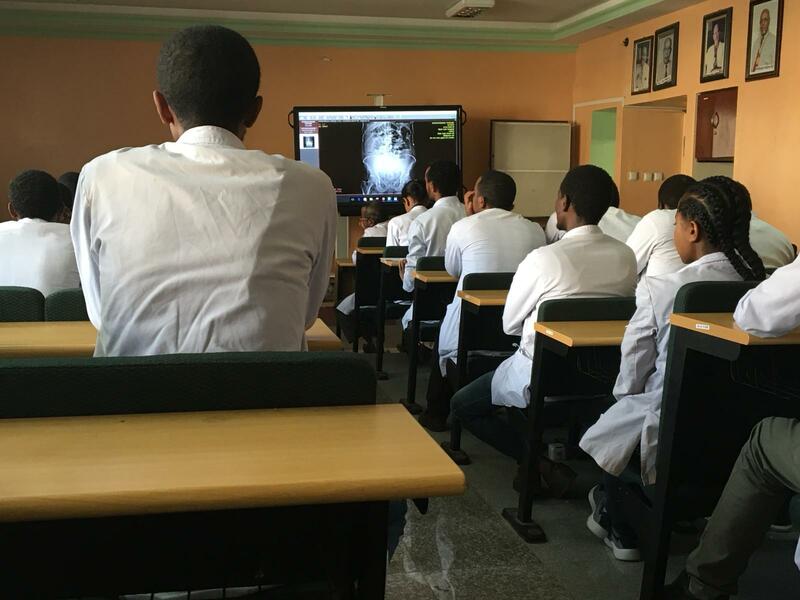 Since 2010, our Department has partnered with Tikur Anbessa Hospital in Addis Ababa, Ethiopia, including introducing laparoscopic surgery methods. Tikur Anbessa is the largest specialized hospital in Ethiopia, and serves as a training center for medical professionals that provide care to the entire country. The hospital has a large operative volume in both general and vascular surgery, making it an ideal learning environment for our surgeons and residents. Tikur Anbessa residents attending an educational conference led by UW members. At Tikur Anbessa, our residents and surgeons will primarily participate in inpatient and outpatient clinical rounds. They will also be involved in the operative and perioperative care of general and vascular surgery patients. With the administrative legwork done, the international rotation program was ready for its first participant: Dr. Callistus Ditah, a third year general surgery resident. He recently returned from his month-long rotation. Dr. Ditah looks to Dr. DiMusto for advice during a case. Dr. Ditah always knew global health was an important part of his calling to medicine. Thanks to strong support from our partners in Ethiopia, and Department faculty and administration, Dr. Ditah is the first, but not the last, resident to benefit from this new rotation. Not only will residents learn valuable skills on the new international rotation, but they’ll also be contributing to a collaborative capacity-building project in vascular surgery. A portion of the resident’s time will be spent in a vascular surgery rotation, along with a vascular surgery faculty member. This year, Assistant Professor Dr. Paul DiMusto joined Dr. Ditah for a week of operating and teaching about vascular disease. Dr DiMusto assisting Tikur Anbessa Hospital’s pediatric surgeons on a case. 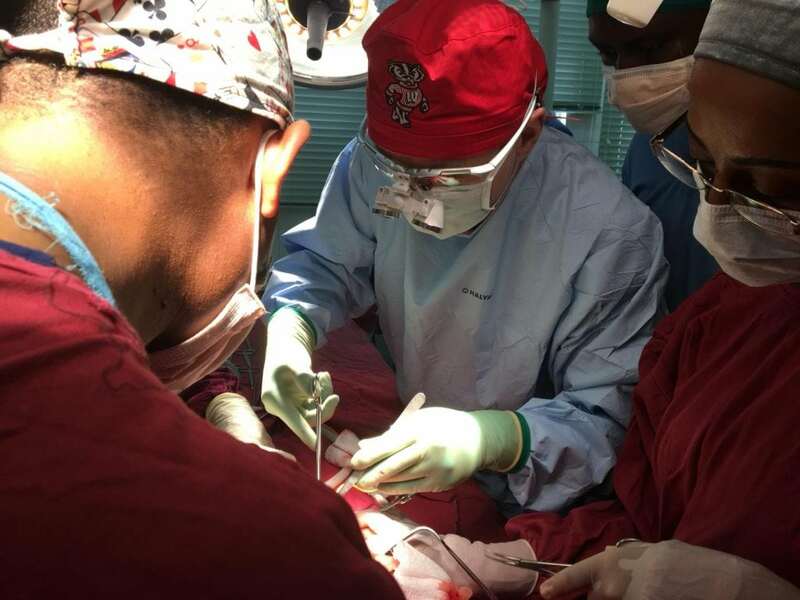 “Our goal is to help Tikur Anbessa start a Vascular Surgery fellowship training program, since there is only one surgeon in the country who currently practices Vascular Surgery,” Dr. DiMusto explained. Want to learn more about this opportunity? Contact Molly Vaux, Department of Surgery Global Health Outreach Specialist, at vaux@surgery.wisc.edu.